Vinegar has been in use since ancient times as a health remedy, cleaning agent and for many other purposes from household to science. Hippocrates (460-377 BC), the revered ancient father of medicine after whom the Hippocratic Oath was named, prescribed it for curing pleurisy, fever, ulcers, and constipation. It was utilized throughout history in other societies as well; for example, the Egyptians are thought to have used it to kill bacteria and the Babylonians relied on it to preserve food and medicines. Apple cider vinegar has the potential to balance pH levels in the human body. This process occurs because of the naturally-occurring acetic acid it contains. When PH levels are balanced, the body maintains an alkaline state which reduces the potential for disease, especially arthritis where this condition is exacerbated in acidic ph conditions. So taking apple cider vinegar in warm water can help to balance your ph and reduce the painful symptoms of arthritis. The acidic nature of apple cider vinegar may be too strong for some palates. For this reason, many people drink it with honey and lemon. Others prefer to add 1 Tablespoon to an 8-ounce glass of water. In addition to the acetic and malic acid, apple cider vinegar also possesses a number of characteristic acids, vitamins, mineral salts and amino acids. These nutrients work together to make cider vinegar the effective health tonic it is today. Among the tonic’s active ingredients are soluble fiber in the form of pectin, vitamin A, vitamin B6, vitamin C, vitamin E, thiamin, riboflavin, niacin, pantothenic acid, beta-carotene and lycopene. The compound also contains minerals such as sodium, phosphorus, potassium, calcium, iron and magnesium. With all of these nutrients and others, apple cider vinegar is effective for treating a wide range of conditions. Often used in conjunction with organic honey, cider vinegar has a range of useful applications including treating osteoporosis, weight loss, leg cramps and pain, upset stomach and sore throat. The liquid can also be used to alleviate sinus congestion, high blood pressure, arthritis and high cholesterol. The tonic is even effective for detoxing the body, stimulating thinking, reversing the aging process, regulating blood pressure and fighting infection. Apple cider vinegar can be used effectively internally and externally. The vinegar is often used as an astringent or toner for treating a number of skin conditions. Other common ailments apple cider vinegar can treat include acne, sunburn, shingles, insect bites, dandruff, allergic reactions and vaginal infections. 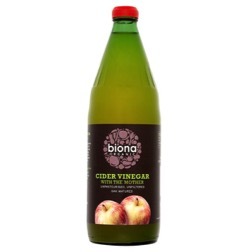 A fermented juice made from crushed apples, apple cider vinegar contains high concentrations of acetic acid, B vitamins, vitamin C and a host of other nutrients. All of these nutrients together function in the body to treat sickness and alleviate illness. Among its treatment applications are diabetes, arthritis, sinus congestion, high blood pressure and several others. It is believed that apple cider vinegar alters the very way the digestive and circulatory systems function in a positive way, making them more effective. More than just a flavoring agent, apple cider vinegar is one of the most effective health tonics available today!